Antony and Paul assemble for a new year of Avengers reviews and discussion. They say "good-bye" to Young Avengers and "hello" to Avengers World. Avengers Now! 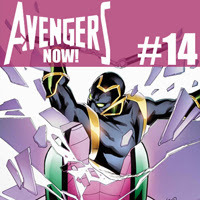 - Young Avengers #14, Young Avengers #15, Uncanny Avengers #15, Mighty Avengers #4, Mighty Avengers #5, New Avengers #13, Avengers #24, Avengers #25, Avengers World #1, and Avengers World #2.